Keeping track of your classroom library has never been easier. 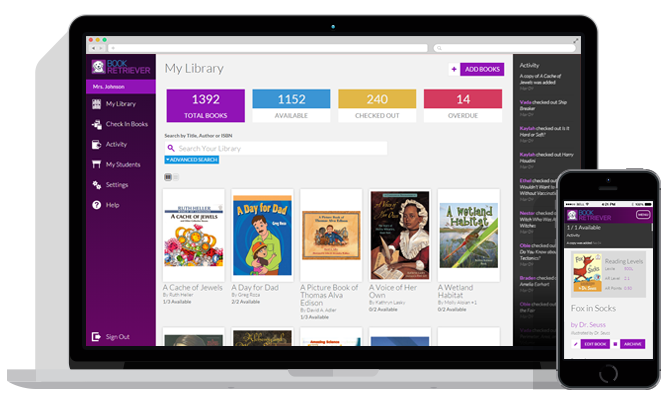 Book Retriever's management tools reduces the number of lost books in a classroom library. The average classroom library loses about 10-20% of their books which comes out to a loss of hundreds of dollars every year. Cutting down the lose rate to just a few percent save teachers money. A Book Retriever subscription more than pays for itself! Start Your 30-day Trial Already have an account? Sign in here. Add and manage books using a browser, our mobile app, or a barcode scanner. Setup your classroom and track individual student reading history. Our leveling data lets you select the right book for each student. Our check-in and check-out system keeps track of who has what book.